I’m breaking my own rule here, and reviewing an album from last year. 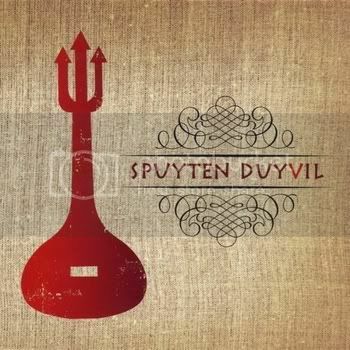 That’s because I only just discovered Spuyten Duyvil this past weekend at the Falcon Ridge Folk Festival. In the last year, there have been some changes in the band too. They have added a drummer and a harmonica player, and replaced their bass player. Nevertheless, In Spite of the Devil offers a fair survey of what makes this band so good. First of all, there are the lead vocals, credited here to Beth Kaufman. Since this album came out, she married songwriter Mark Steven Miller, and she now goes by Beth Kaufman-Miller. This makes perfect sense, because her voice is an ideal vessel for Miller’s words. Kaufman-Miller isn’t going to coo or whisper. She has a strong voice, and expresses emotions naturally. But Kaufman-Miller is powerful, yes, but in control. She can modulate her tone to convey different kinds of emotions. Her voice has both a bluesy and a country quality to it, and she knows how to make it work on a variety of material. The band here includes Mark Steven Miller on bouzouki and tenor guitar, Tom Socol on guitar and dobro, and bass and fiddle complete the band. Sarah Banks gets a beautiful clean tone on the fiddle, and can add wonderful countermelodies or extra rhythmic punch to the songs. Guest musicians add drums, keyboards, mandolin, and cello. So this is the sound of a large mostly acoustic ensemble, and the band is tight. Some songs have hints of old-time jazz, while the traditional song Rain and Snow has a Middle Eastern flavor to it, but mostly, I would call this music folk. There are seven songs in all, and six are originals. But the song Spuyten Duyvil sounds like a traditional song, perhaps from Ireland. I’d love to know if this one is based on a historical event, because it tells the story of how the town of Spuyten Duyvil got its name. Let the Rain Come Down is the repentant blues of a sinner, and here Mark Steven Miller takes his only turn on lead vocals, singing in a Tom Waits-like growl. It suits the song well, but his wife is the better singer. I Know You’ll Leave Me is a country tinged song about the expectation of heartbreak. Miller does not limit himself to any single genre, but he knows well the ones he works with, and yet he also avoids clichés in his writing. And the album works very well as a whole. So Spuyten Duyvil is a band that can perform songs in a variety of styles without sounding like just a visitor to any of them. They have a writer who can deliver those songs, and a lead singer who can put them across beautifully. The current lineup is at least as good as the one heard here, and I can’t wait to hear what they do next. I enjoy your blog - thanks for the work it takes. Re Spuyten Duyvil - The very northern tip of Manhattan Island, where the Harlem River flows into the Hudson is called Spuyten Duyvil. Growing up nearby, many years ago, I remember learning in school that the name means "In spite of the Devil." There was an old Dutch story, that I've since forgotten, explaining the name involving the devilish current that can occur there, and a hero on a desperate mission of some sort who vowed to swim to the other side in spite of the Devil. This matches up to the song. Tarrytown and Tappen are both due north of Manhattan and the shortest route would be to cross from Manhattan to the Bronx across Spuyten Duyvil. Nowdays, the Henry Hudson Bridge spans the river at that location. Actually the translation is often argued to be either "To spite the devil", "spinning devil" or "In spite of the devil". Many believe the spinning devil as there is a whirlpool at the center of the river that's well known. Personally I like the resonance of "to spite the devil" as this is a perfect bluesman's attitude. In Spite of the Devil is the title of the album, only shown on the spine of the album cover. So that's how I chose the translation I used. I have also seen it translated as "spitting devil".